5.85 points at 26 votes (rank 671). 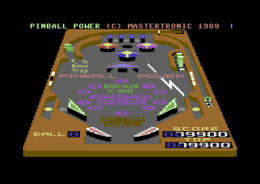 3D Pinball Power is a very realistic pinball simulation. The table is designed as an "oldtimer pinball", which is built up very simply. With 5 balls you try to play as long as possible and reach a high score. As extras there is a "bonus display" (above the flippers), the corresponding "bonus trap" and if "special" is lit an extra ball. Targets are a "Black Hole" (between the three bumpers), three "Revolver Lines" (above the bumpers), a "Hairpin" (in the middle of the table), three "Tombstone Targets" (right of the middle of the table) and six "Sidebar Lights" (left and right of the middle of the table). 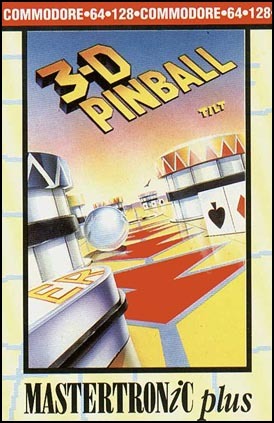 3D depiction of the whole pinball table. Realistic sound effects. The animation of the ball and the accessories as bumpers, etc. is very successful. Otherwise there is no background music. The animations of the ball and the accessories as bumpers, etc. are done very successfully. An option for miore than one player was omitted. Also there is unfortunately no highscore list. ... an animation from the game. If you play the game with an emulator it is advisable to configure both joystick ports as unoccupied. Unfortunately there is not tilt function. The Bonus Wheel where the current bonus points are shown is above the two flippers. If "Special" lights up and the ball gets into the Bonus Trap", you get an extra ball. The Bonus Trap is in the upper right of the table. In the three ball paths at the upper rim of the table there are three displays that are switched and get you each 50 points when the ball passes. If all three are lit, you get 200 points and the bonus wheel is raised by 400. The so-called "Black Hole" is below the ball paths. If the ball falls into it, you get 200 points and the bouns wheel is raised by 300. The three bumpers around the Black Hole make 10 points per strike. The Hairpin is in the middle of the table below the bumpers. The higher the speed of the ball when taking this way, the more points you get awarded (up to 200). Additionally the bonus wheel is raised by 300. The Tombstones raise the bonus wheel by each 1 and are raised up again at the end by hitting the now accessible hole. The six targets at the left and right border are only cleared when both sides get hit. *Inner flipper paths (the way over both flippers): if the ball runs here while the display is lit, the bonus wheel is raised by 100. 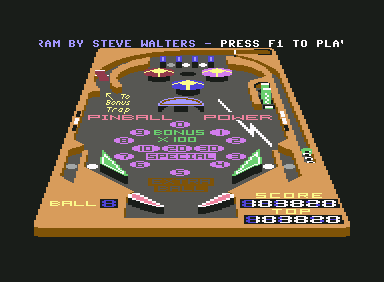 Outer flipper paths: if the ball runs here whil the display is lit, there are full 2.500 points. Here also the old flipper proverb is valid: do not rudder around wildly with the flippers, but try to stop the ball with flippers in upward position and then try to hit the targets with an aimed shot. 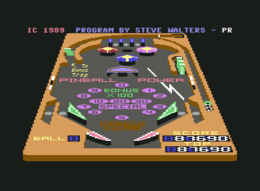 Sledgie: "I think this pinball simulation in one of the best for the C64. The missing music doesn't bother, because this is a model of an older pinball. For me the realistic playability is important in a pinball simulation, which is fully reached by this pinball." FXXS: "A bit too much coincidence and a bit too few targets to be really fun. In fact this is common with the real pinball games in the 1960s, but for the C64 in 1989 there should have been realized a bit more. 7 points." blubarju: "This flipper does not reach my personal favourite Night Mission Pinball but it knows how to please. FXXS is right in moaning about the lack of targets. There could have been a bit more of them. Altogether good 7 points from me." This page was last modified on 11 September 2016, at 16:03.